Fashion photography — in the form of magazines, books, ad campaigns, billboards, and online — rules everything around us, whether we know it, like it, or choose to embrace it. 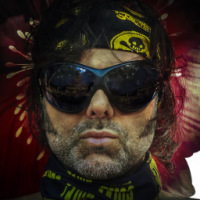 Koozma is a preeminent and influential creative fashion photographer and filmmaker who is renowned for his striking fashion imagery and sometimes disturbing images of beauty. His cultural and commercial zeitgeist has made him a much sought after creative partner in the fashion and beauty industry today. Koozma evokes mood and atmosphere in a color-saturated, expressive photographic style that suggests dream-like, otherworldly scenarios. Though his images are thoughtfully scripted, they also contain unexpected and spontaneous elements, resulting in a rich blend of performance and a painterly photographic style. Constantly testing the different techniques of shooting and illumination elements, Koozma managed to achieve the unusual form of transfer of the photographic image that has laid down in a basis of his original style which he perfects and improves to this day. As the digital camera revolutionized the photography world, he opened real endless possibilities in his expression of his imagination and how to make it real. With a sharp eye and a distinct original style, Koozma is able to capture these absolutely amazing, dreamy shots. Koozma has made his mark as one of the most successful fashion and commercial photographers during the last two decades, while creating his own art along the way. Koozma constantly studies the newest tendencies of modern technologies, he deeply plunge into stylistics and dynamics of fashionable image market innovations in the industries of a modern fashion. He is always open for creative cooperation with young experts and beginner models. Koozma has launched the careers of models, stylists and make-up artists. He has always remained the one effective and well-known fashion photographer with whom all the models aspire to work. At present Koozma shoots for one of the most popular European brand Epatage which is definitely come-up, and his ad campaigns seem to be extremely impressive and innovative. Koozma’s work is many styles in one — colorful gels, monochrome, hard, and soft. He draws out a lot of emotion from his subjects, both in their gestures and faces. Koozma considers that his life credo is a style and uncompromising system of self-expression.